News from Wisconsin | Small Farmers. Big Change. Cold people, tired people, laborers, teachers, state employees, prison guards, police, firefighters, nurses, paramedics, emt, doctors, midwives, hospital workers, organizers, protesters, delivery drivers, union members, small business owners, students, former students, disaffected youth, youth-in-general, small farmers, janitors, third-shift workers, women, men, mothers, fathers, expectant fathers, grandparents, retirees, minorities, veterans, the unemployed, the underemployed, immigrants, LBGT folk, cheese heads, meat-eaters, vegans, vegetarians, clergy, anyone who celebrates their faith, anyone who has lost their faith, anyone who has no faith, packers fans, brewers fans, badgers fans, bucks fans, heck, even steelers and bears fans, townies, out of towners, homeless, line-cooks, wait-staff, chefs, private sector employees, especially those already screwed over by their own companies budget cuts, musicians, visual artists, writers, poets, professors, graduate employees, my aunt; who thinks I am un-American, the disabled, the otherly abled, the people who keep bringing Pizza to the capitol, other people who are donating food, the down trodden, the down and out, those on the up and up, those with signs, those with their fists of solidarity held high in the air, the volunteers who are keeping the capitol clean, the volunteers who are watching the vibes and keeping the protest peaceful, members of the press, independent documentarians, cyclists, athletes, wobblies, tea drinkers, left-leaners, right leaners, socialists, libertarians, social-libertarians, conspiracy theorists, worker-owners, brothers, sisters, Pete Seeger fans, Bruce Springsteen fans, tourists, highway workers, welders, painters, carpenters, electricians, plumbers, bus drivers, train conductors, anyone who has to get up before 6 am, anyone who gets home from work after 6:30 pm, environmentalists, conservationists, truck-drivers, freeloaders, hippies, hipsters, squares, residents of others states, really anyone. Some additions I heard from people today, taxi-drivers, public-attorneys, human service workers, social-workers, badger-care and medicare recipients…Feel free to add to the list. The sign was birthed in about 20 minutes last night on a word document, and created at Fed-Ex Kinko’s at 7 this morning. Also, we were better organized today. Lynsey Miller whipped up a beautiful brewing circuit with Michelangelo’s and Fair Trade Coffeehouse. We maxed out their brewers all day filling Cambros. Willy Street Grocery Co-op helped us brew our first batch of the day at the westside, and let us borrow two more Cambros so we could use both coffee shops to have a constant flow of coffee. Derek, the Equal Exchange Willy Street backup person, came and helped me at the table from 11-6, I couldn’t have done it without him. Everything clicked today. The response to our presence was amazing. The sign was photographed hundreds of times, some people laughed, one woman cried, as she said that she had almost lost her faith. I see our role as two-fold. A) showing solidarity B) Keeping people warm with coffee so they will stay at the Capitol longer. So many people are helping each other out, it’s amazing. The benevolence and cooperation of people during times of struggle is something to savor and remember for a later date, when things don’t seem so promising. 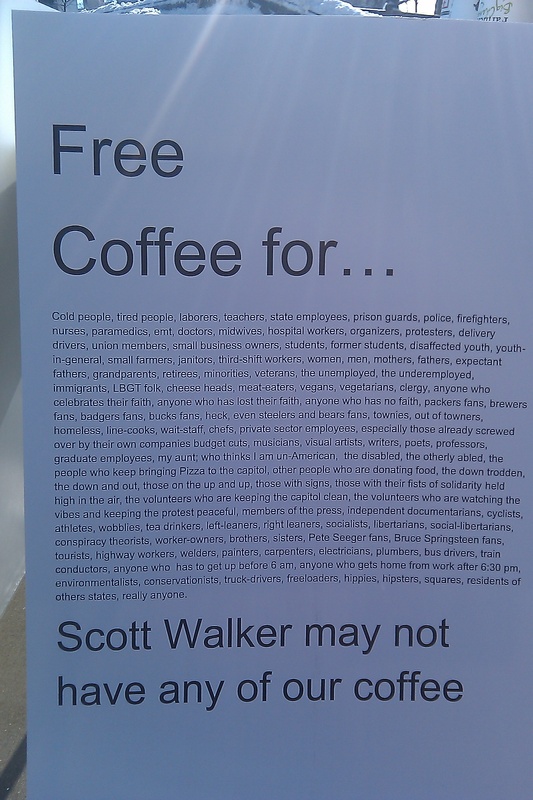 In regards to Scott Walker being refused coffee; Last night he was turned away by the owner of a Capitol square restaurant. They would not serve him. This report was confirmed by more than a couple of people who knew the owner directly. Lastly, don’t hesitate to call or email for updates. This is very inspirational Luke for all of us back the hub. 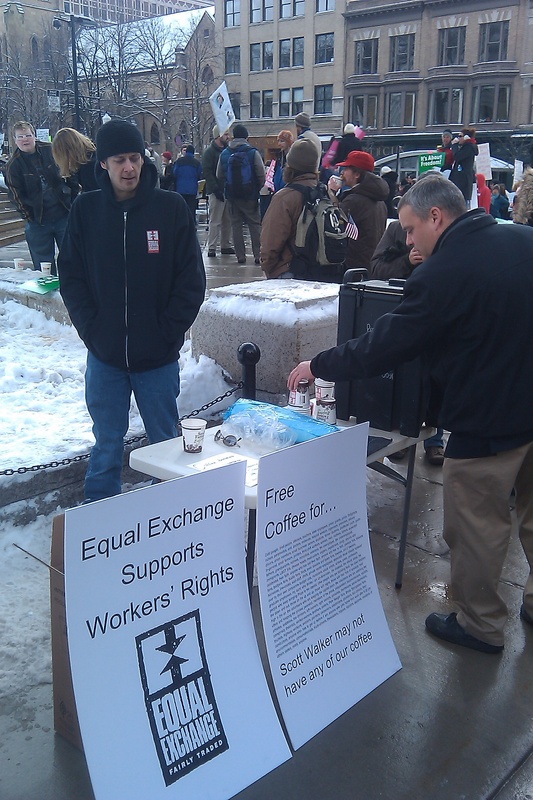 EE started with this same type of grassroots energy and it brings a smile to my face to know we have a presence there in Madison and are supporting the protest with free coffee. Great work; keep it up!!! I feel really, really lucky to work with you and Lynsey and to be a part of an organization that would support our fellow workers this way. That is a fabulous sign! I am saddened that you have taken the issue of fair pay to coffee farmers to the political arena of state politics and unions. I have supported Equal Exchange for at least 10 years as part of the Presbyterian Coffee Project. With this political stunt, I am stopping my support, encouraging my friends to do likewise, and having a motion at the next Presbytery meeting to stop supporting Equal Exchange. Since the start of Equal Exchange, other organizations has come alongside to support fairly traded, organically grown coffee. I will turn to them for my future coffee purchases. I am so glad to see a company that supports small business/individual farmers take a stand for what is right. We are proud to serve and sell your coffee in our gift shop. Keep up the good work. Thanks for not being afraid to fight for what is right, overseas and right here at home!